> Process Apps through voice prompts, sets up in minutes. > More account can be added. A smart access management allow you to limit access with password protection . > Simply use App on your smartphone to survey the environment and remote control your wireless security camera in home. -using 2.4G Wi-Fi or 3G, 4G networks. Troubleshooting about Wi-Fi settings, could you please check according to below? When power supply plug in, the IP camera begin to self-checking automatically and the infrared LED light turn on. Please don't connect the wifi during self-checking mode, and wait approximately 1-2 minutes until the infrared LED light off. Make sure your wifi is 2.4Ghz and the wireless network is turned on and active. Connect your mobile device to the same wifi on which the device is running. That wifi password you have entered is correct. ✔EASY TO SET UP --Using "Add Camera Via Wi-Fi configuration Guide" via "VSmaHome" App on your mobile phone so as to connect your Wi-Fi with VSmaHome 1080p camera step by step, no complicated setting needed of this wireless surveillance camera.Important tips:IP/Network-2.4GHz Wireless(Incompatible with 5GHz). ✔WIDER VISION & MULTI-VIEW --Easy to install on wall, ceiling or table. View live video with VSmaHome APP(Android/IOS). Slide the phone screen to remotely control the camera rotation (horizontal 350 °,vertical 100 °).8x digital clear zoom enables you to see every detail in full 1080P HD. 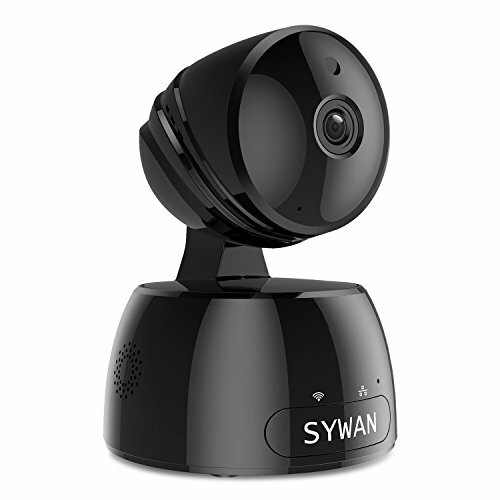 It is a perfect and delicate indoor camera to monitor your baby, elder, pets, babysitter and employees. ✔EXCELLENT DAY /NIGHT VISION & CRYSTAL TWO WAY AUDIO: Intelligent IR-Cut switch ensures clear and high quality images day and night. Non-invasive IR leds, night vision up to 33 feet in pitch dark. Built-in Mic and Speaker offer you a smooth conversation with your family at anytime, anywhere with your mobile phone, tablet or PC. ✔EXCELLENT COMPATIBLE&WARRANTY--Supports remote viewing via iOS/Android mobile devices, Windows PC, Apple Mac system; Compatible with some app/software: IP Cam Viewer/Blue Iris/ Sighthound/iSpy etc. 30 days money back guarantee,and 12 month warranty. If you have any questions about this product by Sywan, contact us by completing and submitting the form below. If you are looking for a specif part number, please include it with your message.